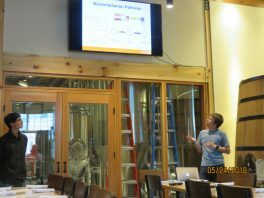 Jared Clements and David Garcia from the University of Tennessee Knoxville’s (UTK) iGEM team were the presenters at Thursday night’s “Beer & Biotech” meet-up hosted by the Academic Alliance of Life Science Tennessee. If you are unfamiliar with the iGEM term, it is tied to the International Genetically Engineered Machine (iGEM) Foundation, an independent, non-profit organization dedicated to education and competition, the advancement of synthetic biology, and the development of an open community and collaboration. UTK has sponsored teams the past two years. Garcia, a native of Chicago who is a doctoral student in the Bredesen Center for Interdisciplinary Research and Graduate Education, said there are 280 teams that vie in the annual international competition. Clements hails from Livingston, TN and will be entering the UT College of Medicine this fall. BELOW: Garcia (left) and Clements during their presentation at the Elkmont Exchange.